Lately it seems like a lot of my plants are leaving me for the big organic farm in the sky. I’ve said goodbye to a few tomato plants, three squash plants, and a cucumber. The only thing looking fat and happy in these ridiculous temperatures are my okra. Note to self: when it gets so hot that almost nothing will grow, figure out more ways to cook okra. Despite the untimely demise of half my garden, I have been able to harvest quite a bit of fruit and vegetables. 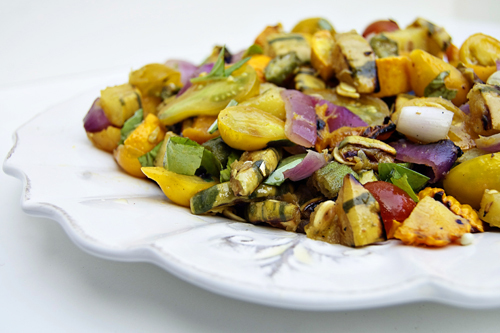 This past weekend I had a party to go and the squash was piling up on my counter (and I couldn’t imagine turning on my oven to make a pie), so I threw together this quick grilled salad. I was pleased with how it turned out. It was light and refreshing with a burst of lemon and some good charred grill flavors. It’s so rewarding to finally start cooking with what’s growing out back, it makes all the hard work worth it, a thousand times over. This salad is great because it can really be made up of whatever you have on hand. 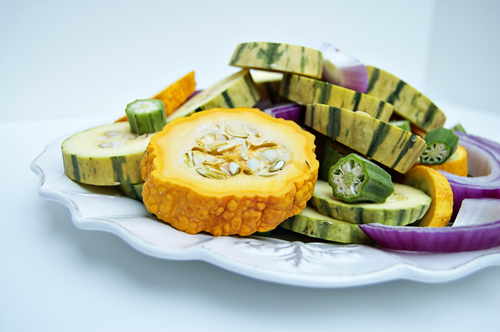 Slice your squash and okra and brush with oil. Grill for 2-4 minutes on each side over medium heat. Remove, chop, and combine with chopped tomatoes, lemon juice, oil and vinegar, salt, and herbs. Chill for 2 hours before serving. 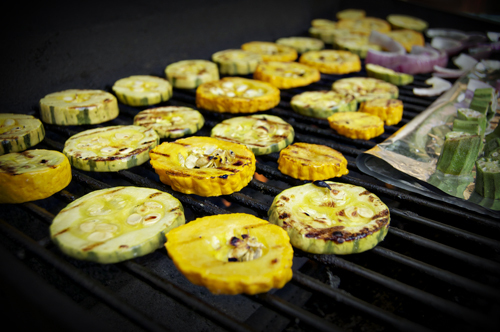 Grilled squash was the centerpiece of my dinner table tonight, too, paired with grilled peaches and some heirloom tomatoes. 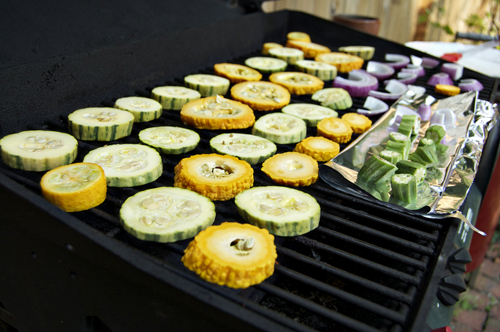 Unlike basically everyone else in the known world, I do not and will not ever get tired of summer squash — keep ’em coming, and keep firin’ up that grill for me!